The secret to maintaining a vibrant and healthy soil that consistently yields strong root and plant growth is the addition of beneficial microorganisms and vital organic matter. Chemical fertilizers and pesticides are not required. approximately the equivalent of 3 inches deep should be applied. If the soil is good quality then about 1 inch application is adequate. Either the compost can be mixed in to the top 3 or 4 inches of the soil, or it can simply be applied as a top dressing. This would depend upon the situation of the area being treated. If it is a new garden area then mixing into the topsoil is preferable but if it is an established garden, then top dressing is preferable. On new gardens a combination of mixing in and top dressing after the garden becomes established is ideal. 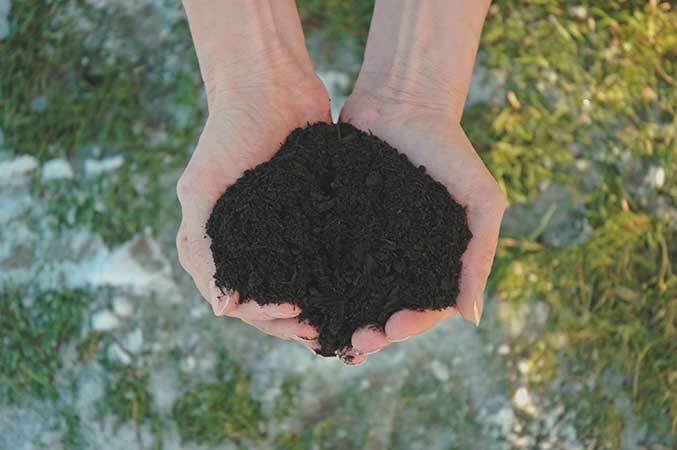 When mixing compost with soil insure that the mixed in compost stays near the surface (3 to 4 inches only) where there is available oxygen to facilitate enhanced microbiological activity. Plants do most of their ‘feeding’ near the surface of the soil. The primary block is then allowed to sit untouched for a minimum multi-month period depending on the time of year. Primary blocks are not handled at all from April to October. This is essential in order to minimize off-site odour especially during warm weather. The secondary blocks once turned out of ‘primary blocks’ are turned several times over the next 12 months. This activity can be highly variable, as to timing and frequency depending on time of year and weather conditions. For example, turning is kept to minimum during warm weather, or not done at all. If weather permits, turning of secondary blocks is more frequent in the early spring, or late fall. The secondary blocks are then turned out into ‘tertiary’ windrows after approximately 1.5 years of primary and secondary block composting. These windrows can be turned frequently if necessary, as off site odour during this stage of composting is not a concern. The total number of turns can vary, however there are a minimum of 15 turns before the material is screened for use. Temperatures above 55 degrees Celsius are routinely recorded in fish compost for long periods of time due to the active and high-energy nature of fish compost. The ”overs” from the screening of the finished compost are then recycled back into active composting process through a variety of processes and functions that Earthbank utilizes to obtain 100 % recycling of all materials brought on site.